Tremendously tall – or ridiculously small: nature never ceases to surprise. 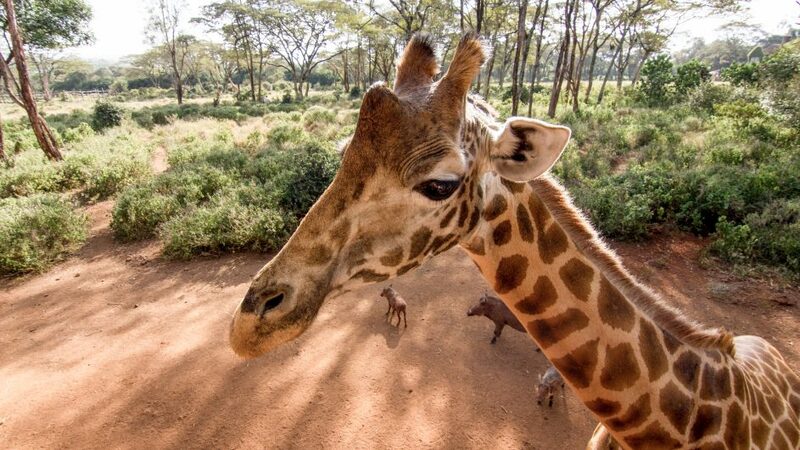 In Africa, we meet the largest birds in the world, ostriches, so massive they can’t even fly; and our planet’s tallest mammals, giraffes. They can stretch their necks to reach leaves up to seven metres high in the treetops. In Africa’s Namaqualand, just one shower is enough to bring the desert to life: plants that look dead suddenly blossom, creating a sea of colour. A feast for all inhabitants, whatever their size! The rain water collects in puddles and ponds, bringing African bullfrogs to the surface. These frogs are Africa’s largest amphibians, weighing up to 1.5 kilograms. Male bullfrogs must protect their brood around-the-clock, always ready to ward off intruders, including other male bullfrogs, who will prey on the young! Borneo has its record-breakers, too. The largest tropical trees fill the rainforests, while pygmy elephants roam this, Asia’s largest island. Big and small – every living thing has its own ingenious methods of survival. The smallest creatures often rely on power in numbers. When termites join forces in their thousands, they can defend their nests against invaders many times larger themselves. And where social spiders gather, their prey better beware. These spiders spin webs that extend up to six metres. They are home to thousands of eight-legged inhabitants that swarm out at the slightest twitch of the web’s fine threads. When tiny brush turkeys flock across the forest floor of tropical Australia, it’s proof of a job well done. They are the products of a successful incubation and hatching, thanks to their industrious dad. Adult male brush turkeys use their enormous feet to build giant mounds of twigs and leaves where the females lay their eggs. The heat generated within the mound by the decaying leaves keeps the eggs warm. If positioned at the right depth, they will be incubated. A few weeks later the hatchlings emerge fully-feathered. But by this time their parents have moved on, so the little ones will have to fend for themselves. Earth’s largest animal can be just as hard to see as some of the smallest because it is so rare. The blue whale is a record-breaker, nearly thirty metres in length and up to 170 tons. But even a blue whale’s mass is nothing compared to nature’s largest structure created by miniscule living organisms: The Great Barrier Reef. It is not one reef, but a constellation of 2,900 individual reefs. The Great Barrier Reef is even visible from space, a natural phenomenon far greater than the sum of its tiny parts and of huge importance to an extraordinary multitude of underwater sea creatures. Meet the big and the tiny in this round-the-world-tour of massive proportions: ‘Tall & Tiny – Nature’s Extremes’.